COE Press Equipment has enhanced the design of its 350 Series Power Straighteners, allowing metal stampers to process a wider range of coil materials including Advanced High Strength Steels (AHSS), which are expected to comprise nearly 40 percent of vehicle content on body and closures by year 2025. COE Press Equipment has announced its enhanced 350 series power straighteners, capable of processing a wider range of materials including AHSS. Through data and FEA analyses, we’ve identified where design enhancements were needed to properly straighten AHSS and achieve the material flatness required by metal stampers. COE Press Equipment’s updated 350 Series Power Straighteners contain new design features that enable processing of a wider range of materials including Advanced High Strength Steels (AHSS). The new coil straighteners offer a 30+ percent improvement in strength and rigidity due to increased roll journal diameter and radius, and increased bearing load capacity. The straighteners also feature enhanced outboard support, new idler shafts, improved backup design and other updates. Importantly, the straighteners also increase work roll penetration by a third, helping achieve the material flatness required to properly feed AHSS. The 350 straighteners handle metal coil widths from 1.0-in. to 54-in., thickness from .010-in. to .310-in., and coil weights up to 30,000 lbs. The broad range of coil stock capability includes cold-rolled steel, hot rolled steel, galvanized, stainless, pre-painted, aluminum and AHSS. 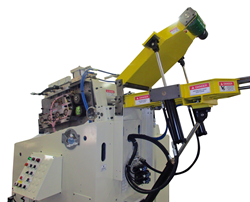 The 350 straighteners are intended to be paired with COE’s ServoMaster™ Series 3 and Series 4 roll feeds. The coil straighteners provide encoder feedback and motorized roll adjustment along with numerous other options. An additional benefit to the COE straightener is its modular design, which enables these straighteners to be retrofit to existing coil processing lines. This ability can enable stampers to quickly upgrade their equipment processing capability for handling of AHSS, saving a significant amount of money as compared to the investment required for a totally new straightener. Overall, the standard design of the 350 series straighteners provides an excellent value to customers.